Ben Garrod is a primatologist and evolutionary biologist. He is a trustee for the Jane Goodall Institute and is a BBC presenter. Sarah Boon is the editorial manager @ScienceBorealis and is an environmental scientist with an academic background in cold regions hydroecology! @Gruntleme: An e-reader. Honestly, no other optional item seems essential. @Gruntleme: Last time my favorites turned out to be Into Thin Air, Eating Animals, Theodore Rex and the Girl Who books. Meera Lee Sethi (@Gruntleme) is a “serial volunteer on biological research projects” and is working on applying to graduate programs in ecology. @PopePolar: My field mascot Fjord! & duct tape. & raingear. & a camera. I don’t travel that light. 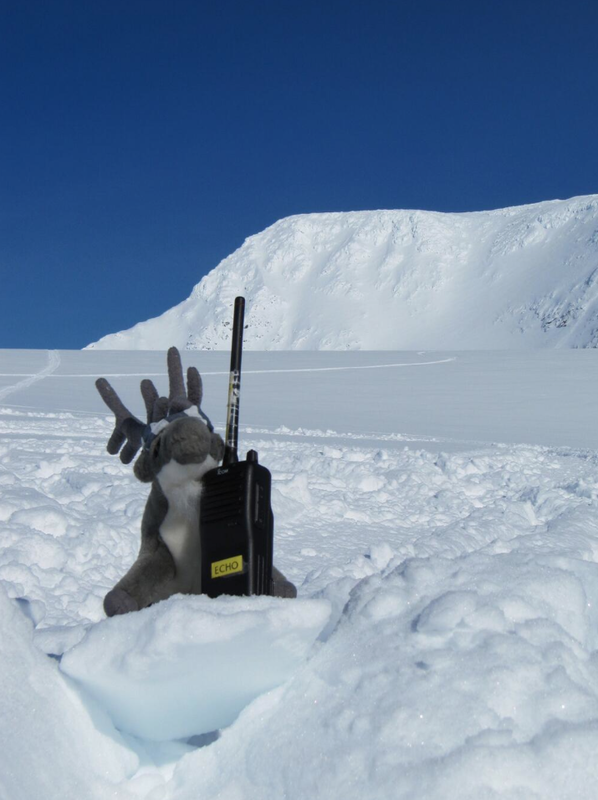 Allen Pope is a postdoc studying snow, glaciers and ice using satellite images with the help of his reindeer Fjord, who is from Svalbard (not to be confused with the continental reindeer)! @Howitt_julia: I usually pack a dissection kit and a roll of electrical take in case equipment needs to be repaired/modified. Plus this is Australia- pack a first aid kit in the car and a snake bandage in your pocket! Dr. Dez is very straightforward in what he needs in the field! He blogs on The Boreal Beetle. Michelle Lavery is a grad student with a passion for the English language and the outdoors. David Shiffman (@WhySharksMatter) runs a very famous twitter page with over 15K followers. He is a marine biologist studying shark feeding ecology and conservation. Dr. Wrasse is a marine biologist who also advocates feminism! She splits her time between New York and Fiji. @MiriamGoldste: If I’m going to sea… Saltines. Good electrolytes and they taste the same on both their inward and return journeys! Miriam Goldstein is a marine biologist and a science communicator. She received her PhD from the Scripps Institute of Oceanography where her research focused on zooplankton and invertebrates that attached themselves to flotsam. @EdFarrelly: Never go anywhere without my diary, I know that’s old school but it helps me to a) dissect the day b) document all the details. Ed Farrelly is a little different from everyone else on this list because he is more of an explorer than a professionally trained scientists. But in a way, aren’t explorers and scientists kind of synonyms? Both reaching out and trying to go where no one has gone before? Ed Farrelly is a world record holding mountaineer and adventurer (Swoon!). At 21 years old he will be attempting to become the youngest Briton to solo a 7000 meter mountain in Kyrgzystan. Well folks! That’s all for now! I’ll post more as people respond to my tweets! I hope you enjoyed, and maybe even learned something! If you have a favorite book or item to bring with you in the field write it in the comments! I would love to hear it!